Daniel Way’s hilarious, action-packed run begins here! When the Merc with a Mouth is hired to rub out Wolverine, sparks will fly! But when both men can regenerate any wound in minutes, how can either one expect to finish off his foe? And whoever wins will have to face Wolverine’s murderous son, Daken! 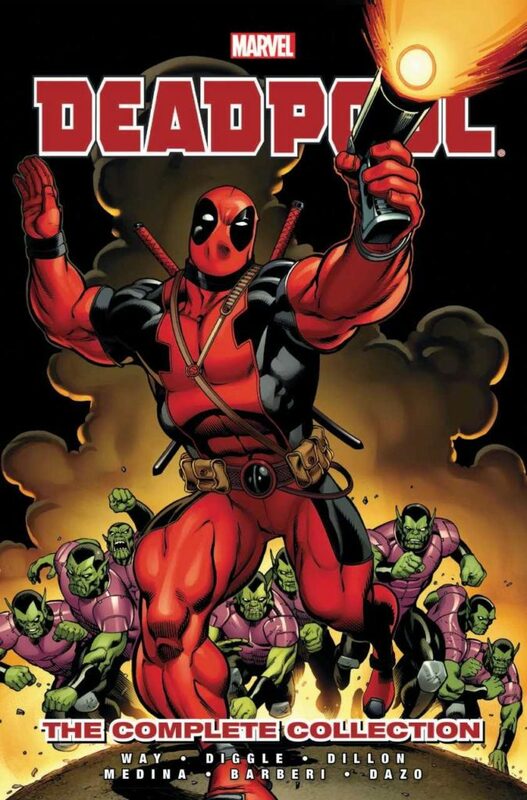 Then: The Skrulls have infiltrated Earth, but nobody warned them about Deadpool! The invaders replicate Deadpool’s healing factor in a new generation of Super-Skrulls – but why is Deadpool himself leading this brigade against Earth? And when Norman Osborn double-crosses Deadpool, the maniacal merc unleashes a full-on assault against Avengers Tower! Norman must pull out all the stops – and that means deploying his new team of bloodthirsty, black-ops Thunderbolts! Oh yeah, the rest of this collection was pretty spectacular too. That is, if you like the idea of DP making the moves on Black Widow, Taskmaster dressing up as DP to have a bit of fun against the Thunderbolts and Bullseye taking on DP at the end of this epic tale.